Hesperaloe parviflora, while commonly referred to as red yucca, is not a true yucca, but an aloe relative. Red yucca is an incredibly versatile landscape succulent. Hesperaloe parviflora can be mixed into perennial and shrub borders or planted by itself en masse in low-maintenance areas. Plants grow in a clump of rosettes that spread slowly, eventually reaching a width of up to 6-feet. The long, narrow, strap-like foliage has a blue-green color that can turn a bit purple during winter. In summer, plants put out tall 5-foot spikes of red to pink flowers. Hummingbirds love the blooms and they are also edible. Once a rosette within the clump has flowered, it won’t flower again. However, new rosettes that continuously grow along the outside of the clump will bloom in the future. 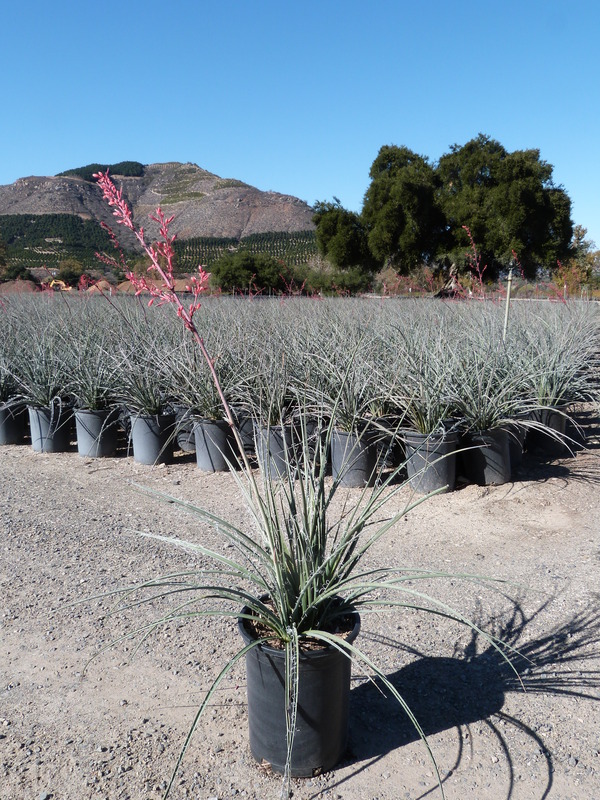 Red yucca should be planted in full sun, but plants can tolerate some afternoon shade. Hesperaloe parviflora plants thrive in hot, dry spots, but will look their best if they benefit from occasional supplemental irrigation or rainfall. Plants don’t tolerate wet feet, so be sure to provide well-draining soil.